The first Seven on Seven took place on April 14, 2010 at the New Museum. It was organized by Lauren Cornell. Read The New York Times on this first edition. Ryan Trecartin was born in Webster, Texas, and raised in rural Ohio, where in high school he designed costumes and sets for theater productions. In 2004, he received a BFA from the Rhode Island School of Design (RISD), Providence. At RISD, Trecartin filmed his constructions for the first time, assembling friends and classmates into a supporting cast that unabashedly explored the 21st century’s obsession with the self and stylized personality through exaggerated dialogue and garish getups. After graduation, Trecartin and his rotating, ever-expanding The Experimental People Band settled in New Orleans, decorating and embellishing the house that would become the backdrop for Trecartin’s breakthrough 2004 work A Family Finds Entertainment. After the house and most of Trecartin’s physical artworks were destroyed in Hurricane Katrina, he moved his practice through Los Angeles, Miami, and Philadelphia before settling back in Los Angeles. David Karp is an American web developer and entrepreneur. He is the founder and former CEO of the short-form blogging platform Tumblr. Monica Narula is an artist and member of the Raqs Media Collective, with training in cinematography and filmmaking, and a background in English Literature. One of the initiators of Sarai, she is a member of the editorial collective of the Sarai Reader series. She coordinates the Media Practice projects at Sarai, directs the Media Lab, and looks after the Sarai Residency Programme. Joshua Schachter is the founder of del.icio.us, a popular bookmark-sharing service founded in late 2003, acquired by Yahoo in 2005, and acquired by Chad Hurley and Steve Chen's AVOS Systems in 2011. He has also worked for Google and Tasty Labs, and he created geoURL, a location-URL reverse directory, and was a co-creator of Memepool. San Francisco-born, New York-based artist Tauba Auerbach has described her work as an attempt to reveal “new spectral and dimensional richness…both within and beyond the limits of perception.” Engaging a variety of media, ranging from painting and photography to book design and musical performance, Auerbach explores the limits of our structures and systems of logic (linguistic, mathematical, spatial) and the points at which they break down and open up onto new visual and poetic possibilities. Ayah Bdeir is an engineer and interactive artist who does not believe in boundaries set by disciplines or cultures. With an upbringing between Lebanon, Canada, and the US, Bdeir's work uses experimental tools to look at deliberate and subconscious representations of identity. Bdeir received her master's degree from the MIT Media Lab and undergraduate degrees in Computer Engineering and Sociology from the American University of Beirut. Her work has been exhibited at MoMA and is part of the museum's permanent collection. Other exhibits include her first solo show Identities in Motion at the Peacock Visual Arts gallery (Aberdeen), the New Museum (New York), Ars Electronica (Linz), Badcuyp and the Royal College of Art (London). Bdeir has been featured in the New York Times Magazine (2011), Inc Magazine (2011), BBC (2011), Elle Oriental (2010), Art Asia Pacific (2009), among others. Kristin Lucas is an interdisciplinary artist. Born in Iowa, she attended undergraduate school at The Cooper Union School of Art in New York City and graduate school at Stanford University in California’s Silicon Valley. She is the recent recipient of a Pioneer Works Technology Residency and an Engadget Alternate Realities Grant. Lucas has taught and advised students at several graduate and undergraduate art programs, including Bard College, California College of Art, New York University, and University of California at Berkeley. Her augmented reality, video, installation, net.art, and performance works have been presented internationally by museums and galleries, including Boston Cyberarts (Boston); The New Museum, The Museum of Modern Art, The Solomon R. Guggenheim Museum, The Whitney Museum of American Art (New York); Center for Art and Media (Karlsruhe); Foundation for Art and Creative Technology (Liverpool); House of Electronic Arts (Basel); Nam June Paik Art Center (Gyeonggi-do); and at festivals, including: Low Lives International Internet Performance Festival, Print Screen Festival (Holon), Transmediale Festival (Berlin), and World Wide Video Festival (Amsterdam). Her videos are distributed by Electronic Arts Intermix (New York); and her broader body of work is represented by And/Or Gallery (Los Angeles) and Postmasters Gallery (New York). Andrew Kortina is a New York City-based entrepreneur best known for co-founding the company Venmo with Iqram Magdon-Ismail. Venmo is now part of PayPal. Kortina studied at the University of Pennsylvania, where he met his future Venmo co-founder when they were randomly paired as freshman roommates. The pair founded Venmo in 2009 with the goal of letting users exchange money via SMS and smartphones. In 2010, the pair was named to Inc Magazine's 30under30. Prior to Venmo, Andrew Kortina worked at bit.ly and OMGPop, which was later acquired by Zynga. Marc Andre Robinson works in sculpture, drawing, and video that revolve around a psychology of historical, cultural, and familial belonging. His work has been presented nationally by the Studio Museum in Harlem, Museum of Art and Design New York, New Museum of Contemporary Art, and the Birmingham Museum of Art, and internationally by Galleria d’Arte Moderna in Turin and the Centre for Contemporary Arts, Glasgow. His awards include an Art Matters grant to travel to South Africa in 2010 and residencies at the Studio Museum in Harlem, the Lower Manhattan Cultural Council, and The Rocktower in Kingston, Jamaica. Born in Los Angeles, Robinson studied at the Pennsylvania Academy of Fine Arts, the Maryland Institute College of Art, and the Whitney Independent Study Program. He lives and works in Brooklyn and currently teaches at Parsons School of Design and Columbia University. With the Hodder fellowship, Robinson will integrate 3D scanning and modeling technology into his studio practice with a focus on creating outdoor works. Hilary Mason is a data scientist in residence at Accel Partners serving as an advisor to the firm’s portfolio companies and assisting with evaluating new technologies and investment opportunities. Prior to that, Mason served as a chief data scientist at Bitly. In 2010, she co-founded HackNY, a non-profit organization dedicated to creating a path for talented students to join New York’s creative technical community through events, education, and fellowships. She has also designed statistical models of careers from a resume dataset for Path101, Inc.
Additionally, Mason serves as an advisor to several New York-based startups, including Knod.es, Collective, and MortarData as well as DataKind, a non-profit organization that brings together leading data scientists. She has served as a mentor to Betaspring and TechStars. Evan Roth is an American artist who applies a hacker philosophy to an art practice that visualizes transient moments in public space, online and in popular culture. Roth and Ben Engebreth were awarded a 2007 Rhizome Commission for White Glove Tracking, which was presented at the New Museum in New York City. 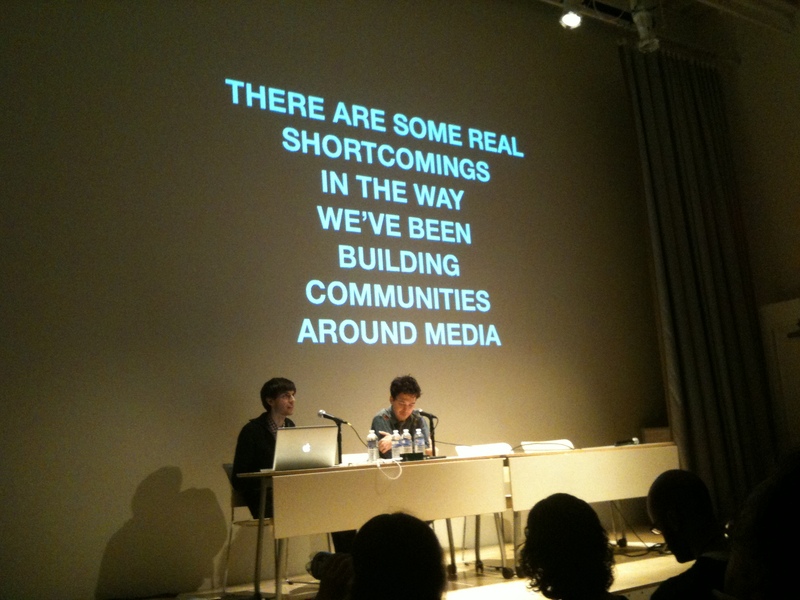 Roth was again awarded a Rhizome Commission in 2008 for his project T.S.A. Communications. Several of Roth's works are in the permanent collection of the Museum of Modern Art. Roth currently lives in Paris with his wife. Matt Mullenweg is a co-founder of WordPress, an open-source blogging platform on the web. He is also the founder of Automattic, the company behind WordPress.com and Jetpack, and Audrey Capital, an investment and research company. Matt got his start in technology working at CNET Networks as a senior product manager. He went on to found Global Multimedia Protocols Group, an experimental metamemetics company, to develop open data formats. He has been recognized for his leadership and success by Forbes, BusinessWeek, INC., PC World, and Vanity Fair. Aaron Koblin is the co-founder and CTO of WITHIN, a virtual and augmented reality company. Prior to WITHIN, Aaron created and lead the Data Arts Team at Google from 2008-2015. Aaron has received numerous awards including the Smithsonian Cooper-Hewitt National Design Award for Interaction Design and the National Science Foundation’s award for science visualization. In 2010 Aaron was the Abramowitz Artist in Residence at MIT. He received his MFA in Design|Media Arts from UCLA. His work is part of the permanent collection of the Museum of Modern Art (MoMA) in New York, the Victoria & Albert Museum (V&A) in London, and the Centre Pompidou in Paris. His projects have been shown at international festivals including TED, Sundance, Tribeca Film Festival, Ars Electronica, SIGGRAPH, the Japan Media Arts Festival, and more. Jeff Hammerbacher is a data scientist as well as chief scientist and co-founder at Cloudera. In addition, he is on the faculty of the Icahn School of Medicine at Mount Sinai. Prior to co-founding Cloudera, Hammerbacher led the data team at Facebook.